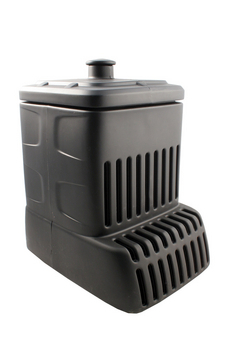 Designed to replace up to 90% of the gravel & rocks used in basin construction. Saves space & money! Manufactured using recycled materials, the AquaBlox™ Water Matrix® is a lightweight structural component developed through years of research and development. AquaBlox™ acts as a reservoir, possessing over 3 times more water storage capacity than gravel, and is designed to replace 90% of the gravel traditionally used in the reservoir of Pondless® Waterfall applications. AquaBlox™ holds up to 7 gallons of water per cubic foot as opposed to gravel, which only holds 2.2 gallons of water per cubic foot in the spaces between the gravel. Since use of the AquaBlox™ results in smaller reservoirs, less labor is needed for excavation and moving of gravel. 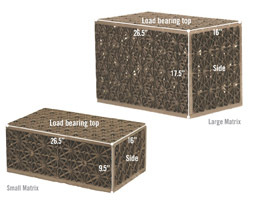 AquaBlox™ can also be used to replace the lower layer of 4 to 6-inch boulders in the bottom of Snorkel™ Vault and Centipede™ Module wetland filter applications, resulting in better water distribution throughout the wetland and more organic loading capacity. The use of less liner and geotextile underlayment which save costs. Eight separate pieces. Ships flat but can be quickly constructed in less than 2 minutes with no tools necessary (I prefer to use a rubber mallet though). Includes a Top, Bottom, (2) Sides, (2) Ends, & (2) Center Supports. All pieces just snap together with no hardware needed! AquaBlox™ comes in two sizes, Small and Large. Improved water distribution and reduced water velocity through the wetland filter provides more effective and efficient filtration. Reduced water velocity improves the settling of sediment from the incoming water throughout the lower portion of the wetland. The AquaBlox™ Water Matrix also provides over 3 times more sediment storage capacity than traditionally used 4-6 inch boulders - which equals longer time between cleanings for easier yearly maintenance. Back flushing and cleaning more effective at removing sediment loads. Less Labor moving and interstacking the tonnage of required 4-6 inch boulders traditionally used on the bottom of the wetland filter. Use the AquaBlox™ Water Matrix to eliminate all the extra excavating, liner and underlayment! Step 1 – Excavate and install the liner and underlayment. Step 2 – Install the Snorkel™ Vault, Centipede™ Module, and the matrix system. Step 3 – Fill in gaps with gravel and set boulder edges. Fold remaining liner over matrix and cover with rocks and dirt. Step 4 – Add water! 4/18/2009 – I have a tall cylinder pottery fountain and through a move, I have lost the reservoir. Do you have replacement reservoirs? . . .
3/29/2009 – I received the Aquascape Aquablox that I am going to use for my pondless pond. I was disappointed that it did not come with . . .